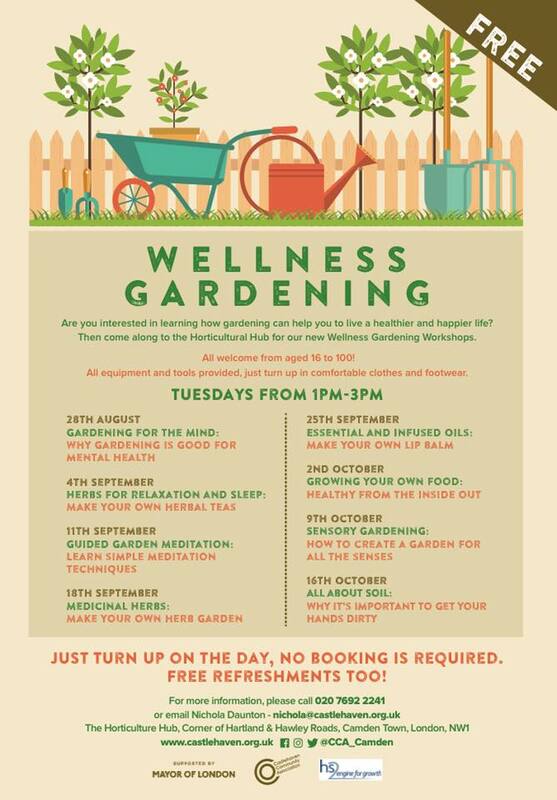 Castlehaven Community Park: A Gardening and Growing Haven! Castlehaven Community Park is in the heart of Camden Town and the largest stretch of green space in the area. We’re supporting a growing community. Read our latest blog posts over on Project Dirt and find out what we get up to. 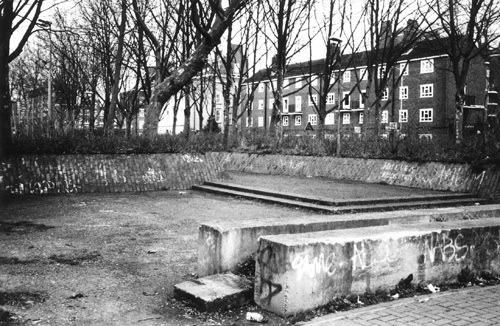 In the early 1980s, it was an underused crime-ridden derelict site. Over the past 30 years, Castlehaven has reclaimed it and transformed the spaces into a haven for our local community to use and enjoy. Managing the space has its challenges: the site is quite open, and we’re a community organisation running a public park. Camden Market, one of London’s biggest tourist attractions, which is nearby, brings litter issues, while a large development takes shape opposite. We’ve also had the odd setback trying to do different things with the space, with some activity working better than others. Castlehaven Community Park sits at the heart of the community. We’re dedicated to providing a natural and beautiful space for families to grow, play and learn. We have a floodlit astro turf sports pitch in the middle of the main community park, which is used heavily by children and adults throughout the year! Surrounding this are green areas where people sit, relax, exercise and dog walk. We also have yearly community festivals held within our community parks for all to enjoy. 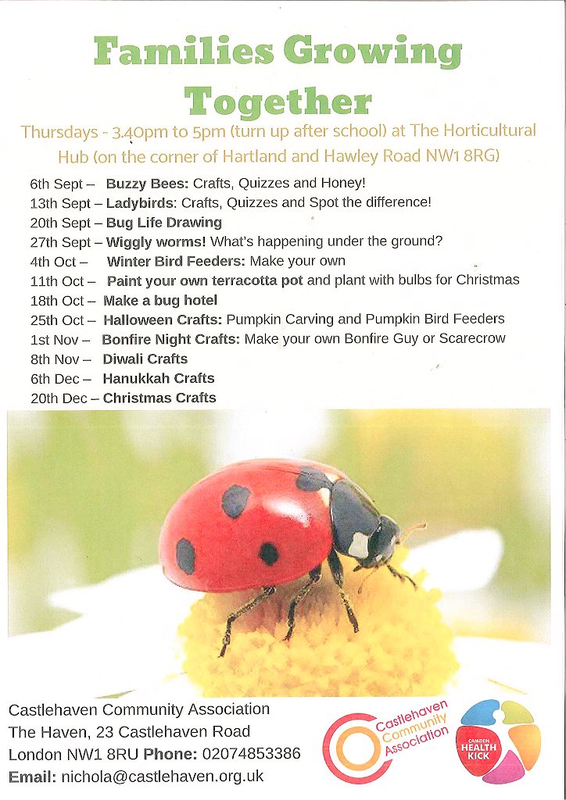 We provide engaging and educating workshops through our Horticultural Hub and encourage the local community to get fit and active with our regular gardening sessions. The dereclict site of our Horticulture Hub in May 2017 and our Horticulture Hub now. 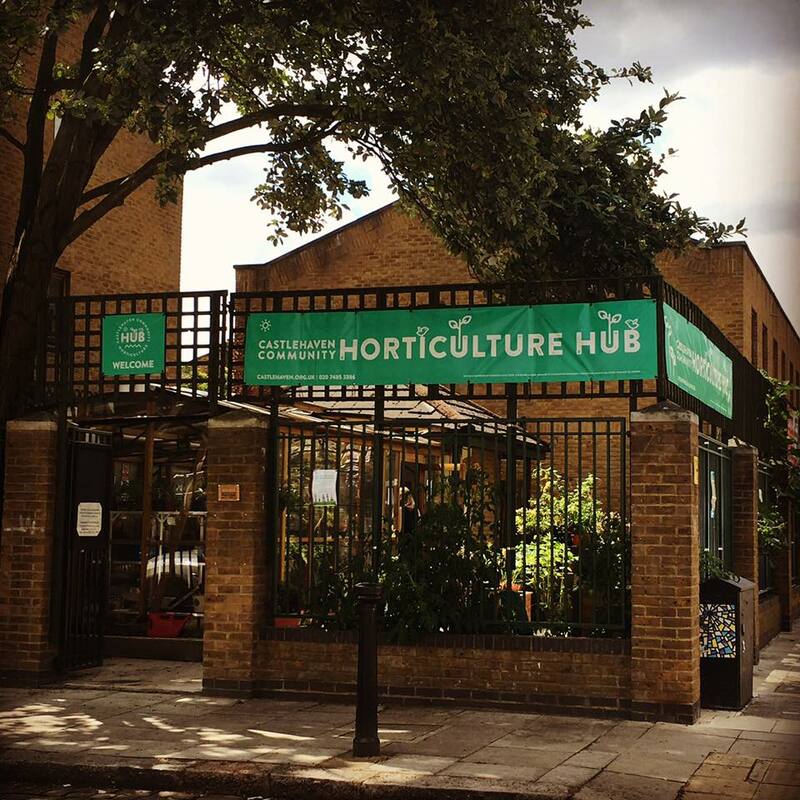 Since the Hub opened in October 2017 we’ve been engaging the local community with gardening workshops and arts & craft activities, as well as providing a much-needed green space in the middle of Camden. We grow our own food, everything from radishes to runner beans, which is then used in Castlehaven’s cookery workshops and donated to elderly and vulnerable people in our local community. 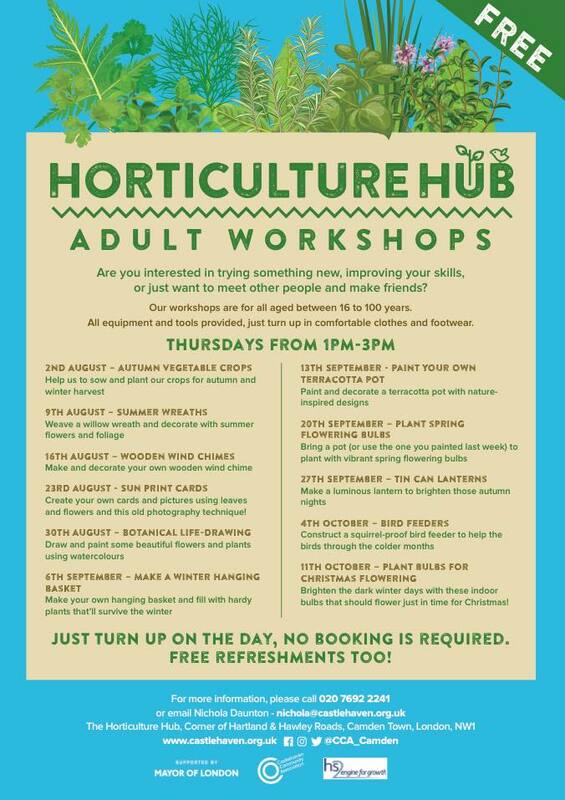 The Hub is managed by a dedicated team of volunteers, so if you’d like to get involved, pop into the Haven or email our Environmental Engagement Coordinator Nichola Daunton. We’re pleased to announce that our nature garden will be opening in spring 2019. We’ve faced some significant delays, but thanks to the charity Groundwork, we’re back on track! The Nature Garden will be a secure area in the existing Castlehaven Park where wildlife will be free to thrive. This development will help deal with the antisocial behaviour, littering and rough sleeping that has been a problem in this area of our community park. Once the works have been carried out, we will host a party to unveil the new area to the public. Then we’ll be opening the nature garden to the local community and inviting school children in for forest school activities. Our nature garden will be a Dog Free Zone and open at specific times for local residents of all ages to enjoy and learn from. If you’d like to find out more about our plans, please email nichola@castlehaven.org.uk. To receive regular news updates, subscribe to our Community Park & Horticulture Hub Newsletter.